09 October 2013, 1:00 UTC: The Guinea Total Lightning Network was able to detect strong overnight storms over neighboring Guinea-Bissau, particularly in the vicinity of the capital. Simulated radar generated by our Total lightning network showed a very strong storm with very frequent lightning. The alerting system generated a dangerous thunderstorm alert (DTA) for parts of he coast and the harbor area for extremely heavy rain, gusty winds and frequent lightning. The purple polygon below shows the area under the DTA. 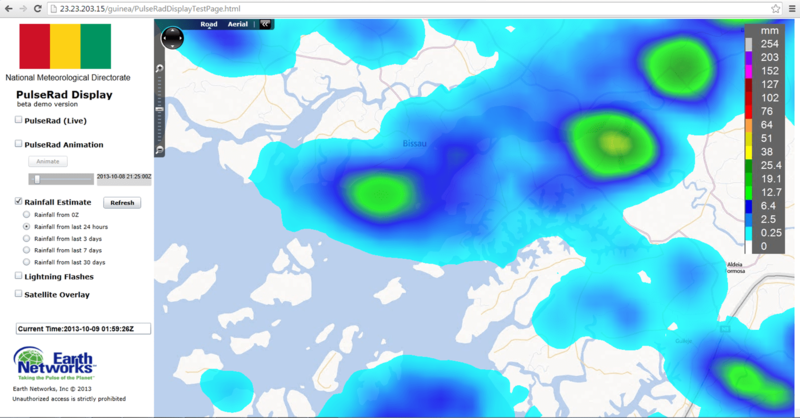 Rainfall estimated by the PulseRad simulated radar system shows that rainfall accumulated 20-50mm of rain in just one hour.